A Dubious Past examines from a new perspective the legacy of Ernst Jünger (1895-1998), one of the most fascinating figures in twentieth-century German intellectual life. From the time he burst onto the literary scene with The Storms of Steel in the early 1920s until he reached Olympian age in a reunited Germany, Jünger's writings on a vast range of topics generated scores of controversies. In old age he became a cultural celebrity whose long life mirrored the tragic twists and turns of Germany's most difficult century. Elliot Neaman's study reflects an impressive investigation of published and unpublished material, including letters, interviews, and other media. 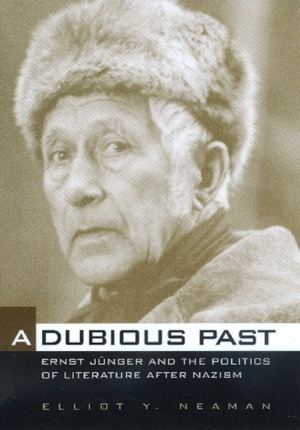 Through his analysis of Jünger's work and its reception over the years, he addresses central questions of German intellectual life, such as the postwar radical conservative interpretation of the Holocaust, divided memory, German identity, left and right critiques of civilization, and the political allegiances of the German and European political right. A Dubious Past reconceptualizes intellectual fascism as a sophisticated critique of liberal humanism and Marxism, one that should be seen as coherent and—for a surprising number of contemporary intellectuals—all too attractive. Elliot Y. Neaman is Associate Professor of History at the University of San Francisco.